A Multi Day Sailing Cruise by Spiridakos Sailing Cruises. 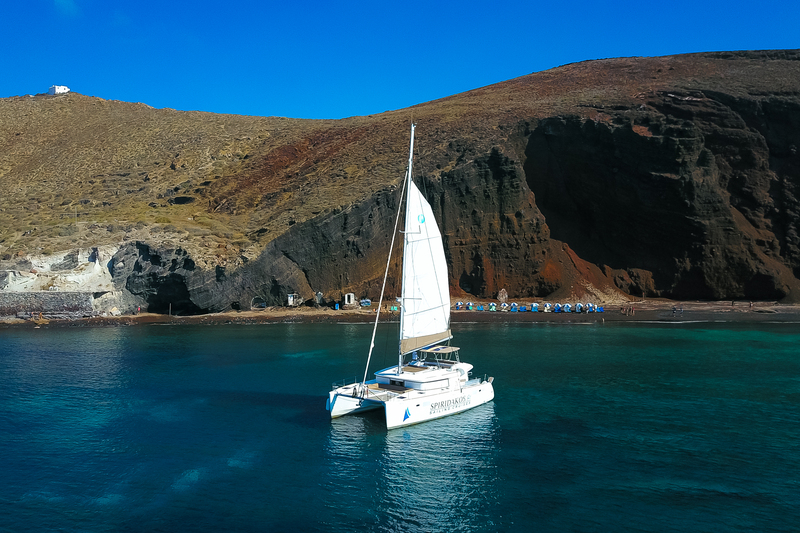 Set sail from Santorini Island aboard a Luxury Catamaran. Explore the Southern Cyclades islands of Ios, Sikinos as well as Folegandros. Your sailing cruise experience starts from Santorini, by exploring its beauties and highlights. Sail past the Red and White beaches and the Caldera Coastline. Swim at the Hot Springs, sail past Oia and Thirassia island and visit all picturesque locations Santorini is famous for. Our three day Sailing Cruise continues to the cycladic island of Ios, where you have the opportunity to swim at wonderful beaches as well as visit unique sights. Most noteworthy, Maganari is one of the most acclaimed beaches of Ios, known for its crystal blue waters and its golden sand. Furthermore, explore the island before the day ends at the port. Disembark and discover Ios’ nightlife, walk its traditional alleys as well as its traditional villages, Skaros and Palaiokastro. Finally visit the Archaeological Museum as well as the Church of Panagia Gemiotissa of Ios. Similarly, at our second day of the sailing cruise, we stop at Sikinos, an island of merely 150 inhabitants. Enjoy an entire day in the island, filled with pleasurable wine, honey and olives. Additionally, swim at some of the island’s most beautiful crystal blue beaches. Even more, during your evening stay, explore Sikinos’ beauties and enjoy a dinner at Agios Nikolaos Tavern. Finally, remember to pay a visit to the Temple of Zoodohos Pigi and get a taste of the orthodox culture. On our third day of the Sailing Cruise we visit Folegandros. An island of the Cyclades complex with magnificent beaches, sprinkled with delicious tastes. Combine watermelon and cheese production with pasta variety samplings. While being on the coast you can witness beautiful sights and walk at narrow cobbled streets. Finally, visit the Castro (Castle), a medieval settlement built to protect the Island’s inhabitants from enemy invasions alike.